A method for the analysis of short-chain and medium-chain chlorinated paraffins (SCCPs and MCCPs) in house dust was developed. The method is based on sonication extraction, sample cleanup by solid phase extraction (SPE), and separation and detection by gas chromatography coupled with mass spectrometry (GC/MS) operated in electron capture negative ion (ECNI) chemical ionization mode. The method is sensitive, with method detection limits (MDLs) down to 0.22 μg/g for SCCPs and 0.55 μg/g for MCCPs. The overall recoveries of the method were 104 (± 11)% and 108 (± 16)% for SCCPs and MCCPs, respectively. The method was successfully applied to the analysis of SCCPs and MCCPs in NIST standard reference material (SRM 2585, organic contaminants in house dust) and a subset of house dust samples collected under the Canadian House Dust Study (CHDS). 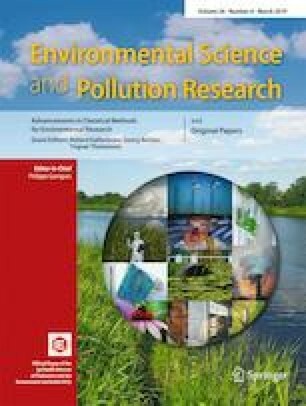 Average concentrations of SCCPs and MCCPs in SRM 2585 (n = 12 replicates) were 7.58 (± 0.43) μg/g for SCCPs and 16.4 (± 2.1) μg/g for MCCPs, respectively. A comparison was made between CP concentrations in paired dust samples collected using two different methods from the same homes: fresh or “active” dust (FD) collected by technicians and a sample taken from the household vacuum cleaner (HD). Spearman rank analysis showed a significant positive correlation (p < 0.01) between FD and HD samples for both MCCPs and SCCPs. CPs were detected in every house dust sample (n = 48 HD samples), with median (range) concentrations of 6.2 (4.0 - 57) μg/g and 19 (5.9-901) μg/g for SCCPs and MCCPs, respectively. Widely scattered CP levels and 100% detection frequency in this preliminary set of 48 HD samples suggest a wide variability in Canadian household exposures to CPs. The online version of this article ( https://doi.org/10.1007/s11356-018-04073-2) contains supplementary material, which is available to authorized users. We thank Christine Levesque for sample preparation and inventory; Dave Gardner for assistance with statistical analysis; Water and Earth Science Associates Ltd. for participant recruitment and vacuum sampling; Drs. Jongchul Kim and Guru Prasad Katuri of Health Canada for internal review of the manuscript. The Canadian House Dust Study (CHDS) was approved by Health Canada’s Research Ethics Board and was funded by the Chemicals Management Plan (CMP), Government of Canada. Dr. Shang thanks Natural Sciences and Engineering Research Council of Canada (NSERC) for providing him with the visiting fellowship to conduct research at Heath Canada. On behalf of all the authors (Hongtao Shang, Xinghua Fan, Cariton Kubwabo*, and Pat E. Rasmussen), I declare that there is no conflict of interest with any financial organization regarding the material discussed in the manuscript.